Ethernet interface board with a single RJ45 connector for connection to a 10/100 Base-T Ethernet network. Ethernet-to-RS485 converter board. Includes an RJ45 connector to the Ethernet plus an RJ11 connector to an RS485 network with up to 31 Laurel meters, counters, timers, and remote displays. These must be equipped with Laurel's RS485 interface board, which features dual RJ11 connectors for RS485 daisy-chaining using commercial 6-wire RJ11 data cables, with no need for a hub. Both boards are supported by Laurel's new Node Manager software, which discovers and configures Laurel Nodes on an Ethernet LAN and then discovers and configures the Laurel meters associated with each node. Please see our Ethernet Manual. USB 2.0 interface board with a single Type-B connector for a standard USB cable. Allows plug-and-pay connection of a meter or counter to to the new generation of computers which have USB ports but no RS232 com port. Ideal for programming instruments with Laurel's free Instrument Setup Software. The board can be removed once the instrument has been programmed. USB 2.0 to RS485 converter board. Includes a USB Type-B connector for USB 2.0 communications plus an RJ11 connector for RS485. Allows a meter or counter to communicate with a PC via a USB cable while also serving as the USB-to-RS485 converter and hub for connection of the PC to an RS485 network with multiple meters and counters. The industry-standard Modbus protocol and Laurel ASCII protocol are fully supported. Model QLS Quad Output Loop Splitter / Retransmittersources up to four (4) independently adjustable 4-20 mA outputs from a single input, which can be 4-20 mA, 1-5V, 0-5V or 0-10V, as selected by jumpers. The outputs can share a common ground. The input and outputs are mutually isolated to ±10V by means of active circuitry to accommodate differences in local grounds with normal industrial grounding practices. If any device in an output loop is removed from a loop or fails, or if a wiring fault occurs, the other loops continue to operate properly. Each loop only drives a single load, avoiding compliance problems. Model QLS overcomes problems associated with the common industrial wiring practice where the same 4-20 mA signal from a transmitter is sent to multiple devices in series. In such a circuit, the devices in the loop cannot share a common ground, but must be electrically floating, which is often not possible. When any device in the loop is removed, fails or if a wiring fault occurs, all other devices in the loop loose their 4-20 mA signal. In a single loop, the transmitter voltage compliance limit may be exceeded, since the voltage drops across loads in series are additive. Also, the 4-20 mA signal to each load cannot be individually adjusted for calibration purposes. The LTS6 Serial Input to Analog Output Converter accepts RS232 or RS485 serial data with the Modbus or Laurel ASCII protocol, and converts it to an isolated, scalable 4-20 mA, 0-20 mA or 0-10V analog output signal. The unit fits on a 35 mm DIN rail and is only 22.5 mm (0.89") thick. It is normally powered by AC (85-264 Vac), but can optionally be powered by low voltage AC or DC. All electrical connections are via detachable screw-clamp plugs. The Analog transmitter output is exceptionally accurate. 16-bit resolution provides an ultra-fine resolution of 0.0015% and accuracy better than 0.02% of output span. Output isolation from signal, power and serial communication grounds is provided by a separate on-board transmitter power supply, thereby eliminating potential problems caused by ground loops. Dual solid state relays for control or alarm are standard. The relay outputs are i isolated isolated and are rated for a 120 mA current at 140 Vac or 180 Vdc. New True RMS Meter is accurate to 0.1%, responds in one 50/60 Hz line cycle. Ultra-fast, true RMS measurements at rates up to 60 Hz, or down to 17 ms between measurements. This allows AC power line problems to be detected and acted upon using relays at the end of every AC line cycle. Fast meter response can avoid expensive equipment damage in case of an AC power problem. Fast response also allows peak and valley capture of transients (standard), and is also great for datalogging. High accuracy with error less than 0.1% of full scale for amplitudes from 100% of full scale all way down to 0%. Accuracy is maintained for frequencies from 10 Hz to 10 kHz and a crest factor up to 3.0 at full scale, which accommodates very distorted waveforms. AC or DC coupling. DC coupling was not available in Laurel's previous RMS meter. Upgraded line of DIN Rail Transmitters improves resolution 16-fold, makes former options standard. The model numbers of the new transmitters all start with the letter L. LTA series transmitters, where the A stands for "Analog output," and LTM series transmitters, where the M stands "Mobus serial output," are now really the same series. We kept the series model numbers different for continuity with the previous TA and TM series. Laurel transmitters are available for most types of industrial signals and accept the same signal conditioner boards as Laurel's meters and counters. This includes analog signals such as DC, AC, process, load cell and temperature, plus pulse type signals such as contact closures, TTL outputs, or the output of turbine flow meters and quadrature encoders. The transmitters are set up using the same Instrument Setup Software as Laureate digital panel meters and counters, and offer the same rich set of programmable features, such as output scaling and selectable digital filtering modes. Two quad-relay boards have joined the existing two dual-relay output boards, and are applicable to all Laureate digital panel meters, counters, timers and remote displays. The price premium for the additional two relays is only $20. There are now four Laureate relay options: 1) two contact relays, 2) two solid state relays, 3) four contact relays, and 4) four solid state relays. 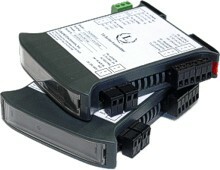 The contact relays are rated for 8A at 250 Vac or 24 Vdc. The solid state relays can switch AC or DC and are rated for 120 mA at 140 Vac or 180 Vdc. Solid state relays do not experience contact wear and are recommended for frequent operation or switching very low currents. Each of the relays can be programmed for maximum flexibility for alarm or control: 1) to have its own setpoint, 2) to be activated above or below the setpoint, 3) to be latching or non-latching, and 4) to operate in the hysteresis or band deviation mode around the setpoint. An upgraded RTD board is now shipping, which is capable of handling 10-ohm Copper RTDs and 120 ohm Nickel RTDs in addition to the previously available two types of 100 ohm platinum (Pt100) RTDs. The new board is factory calibrated and linearized for the following four RTD types: 1) 100-ohm platinum RTD with DIN alpha of 0.00385, 2) 100-ohm platinum RTD with ANSI alpha of 0.003902, 3) 10 ohm Copper RTD with alpha of 0.00427, and 4) 120 ohm Nickel RTD with alpha of 0.00672. While RTDs have a narrower temperature range than thermocouples, they are more linear and much more accurate. They are ideal for Laureate meters, which have an A/D conversion accuracy of 0.01% of full scale. By using adaptive digital noise filtering, Laureate RTD meters can provide stable temperature readings with a resolution of 0.01°C or 0.01°F, while responding rapidly to actual changes in signal. Laureate RTD meters allow 2, 3 or 4-wire hookup. With 3 or 4-wire hookup, the meter automatically removes effects caused by lead wire resistance in long cable runs. A new ohms resistance measurement signal conditioner board is now shipping. It offers five resistance ranges: 1) 20 ohms with 1 milliohm resolution, 2) 200 ohms with 10 milliohm resolution, 3) 2,000 ohms with 100 milliohm resolution, 4) 20,000 ohms with 1 ohm resolution, and 5) 200,000 ohms with 10 ohm resolution. One of the applications for resistance panel meters is to measure contact resistance in production environments. This is where the extremely low 1 milliohm resolution shines. As for the Laureate RTD meter, 3- and 4-wire hookup allows the meter to eliminate the effect of lead wires, whose resistance would otherwise be included in resistance measurement. A special 2 megohm range is available as a factory special. Single-channel analog output option for panel meters & counters improves resolution 16 fold, adds bipolar ±10V output. Laurel's single-channel analog output option has been upgraded to 16-bit resolution, which offers a 16 times smaller step size than the previously available 12-bit resolution. The new board also adds a ±10V bipolar output. An isolated analog output has long been popular for Laureate digital panel meters and counters, since it effectively turns these instruments into isolated, linearized transmitters. The analog output is linearized to the reading and can have the fast update rate as the display. The meter reading and analog output can be independently selected as filtered or unfiltered. A new 16-bit isolated analog output board provides two individually configurable and scalable analog outputs for Laureate counters, timers and remote displays. While these instruments can only display one item at a time, they are able to track multiples items simultaneously. For example, the Laureate Extended ratemeter and totalizer can simultaneously track rate (such as flow rate) and total (such as fluid volume). These parameters can each be displayed at the press of a button and can now also each have an associated 4-20 mA transmitter output. Available output levels are 4-20 mA, 0-20 mA and 0-10V.